My favourite winter breakfast is hot buckwheat porridge. With a spoonful of home-made Caspian Sea yoghurt, a dash of Sweetree honey and a sprinkle of Trade Aid cinnamon, it’s warming and sustaining. 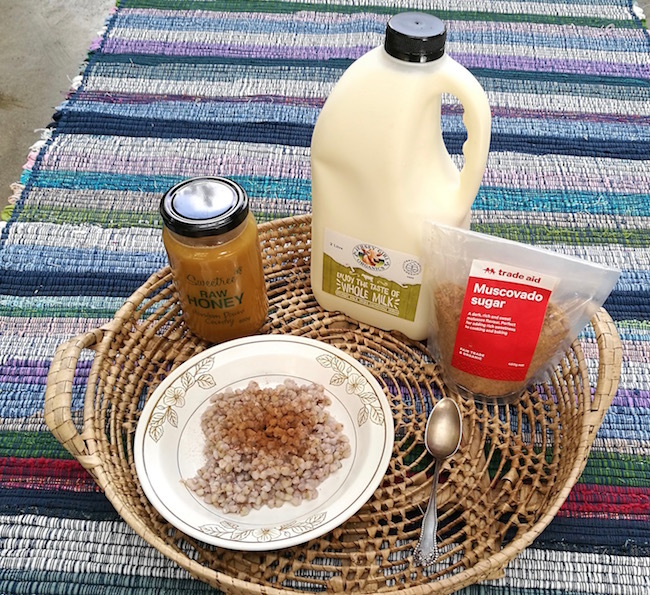 For the purposes of the Waikato Foodbasket, the locally produced parts of this breakfast are the honey and the yoghurt, which I made with Jersey Girls milk. Buckwheat porridge has a distinctive, toasty flavour that’s quite different from porridge made with oats. It satisfies Northern European ancestral food cravings that I didn’t realize I had. The buckwheat in my porridge is Ceres, certified organic, grown somewhere in China. I buy it from Village Organics, and also from Bin Inn in Hamilton East. But buckwheat is also grown in the South Island. (See the end of this post for where to buy New Zealand-grown buckwheat.) It would be possible to grow buckwheat in the Waikato, if we weren’t already converting every flat piece of land into intensive dairy farms. Above: Buckwheat porridge, Jersey Girls milk, Sweetree honey, Trade Aid cinnamon and muscovado sugar… mmm! Buckwheat, Fagopyrum esculentum, isn’t a grain and doesn’t contain gluten. The grain-like buckwheat groats are the hulled seeds of a plant that’s related to sorrel, knotweed, and rhubarb. It’s full of protein and other nutrients. 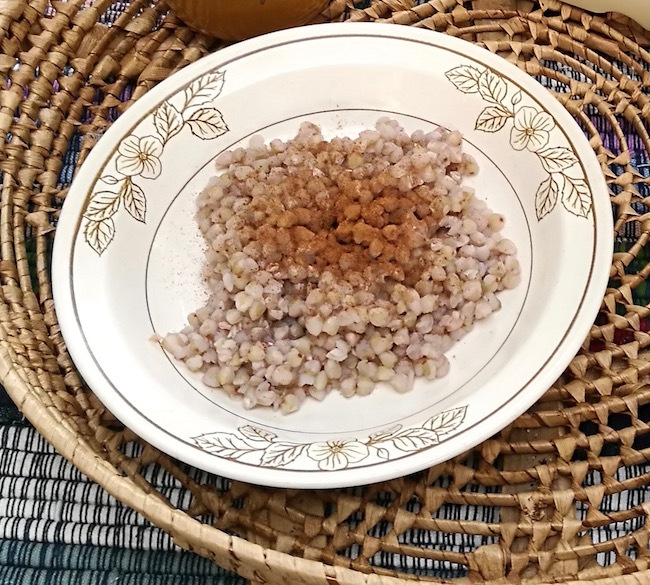 Buckwheat originated in South-east Asia and was commonly grown throughout Asia and Europe from the early days of agriculture. In 5300 BC it was being grown as far north as Finland. It’s a short-season crop (Kings Seeds say it matures in 90 days from direct sowing), so is useful for places with a short summer. 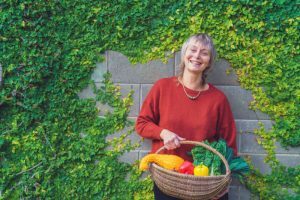 In many regions it’s possible to grow two full crops in one season. The cultivation of buckwheat as a staple declined sharply in the 20th century with the development of nitrogen fertilizers that dramatically increased the productivity of grains such as wheat, corn and rice. Buckwheat grows well in low-fertility soil and doesn’t like too much fertilizer, especially nitrogen. Buckwheat is also a valuable plant for organic agriculture. It is popular with organic and biological farmers as a green manure crop, to suppress weeds, for erosion control, and as wildlife cover and feed. I had a few buckwheat plants in the garden last year, planted to encourage beneficial insects. The plants had glossy green, heart-shaped leaves and fragrant white flowers in clusters, which were popular with bees. Buckwheat leaves are traditionally eaten in Asia and Europe – but the leaves contain a toxin that causes sensitivity to light, so consuming too much is not advised. Place 1 cup of buckwheat groats in a saucepan. Add 1 cup water. Leave overnight to soak. In the morning add one cup of boiling water and a pinch of salt, and bring the pan to a simmer. Cook for 5 minutes – and your buckwheat porridge is ready to eat. This makes enough for three medium sized servings. www.grainmills.co.nz Buckwheat groats, unhulled buckwheat and home-scale mills. www.biograins.co.nz Buckwheat flour and unhulled buckwheat for cover cropping etc.